Melissa Cooke, 'This is What you Wanted (Self Portrait with Onions),' 2009, graphite on paper, 50 x 38', at Koplin Del Rio Gallery. Melissa Cooke is a young artist based in Madison Wisconsin who is an incredibly talented draftsman. In her solo debut she presents larger than life sized graphite on paper self portraits, acting out and performing for the camera. Cooke dresses up to investigate the many sides of self, and thus her work is akin to that of Cindy Sherman. 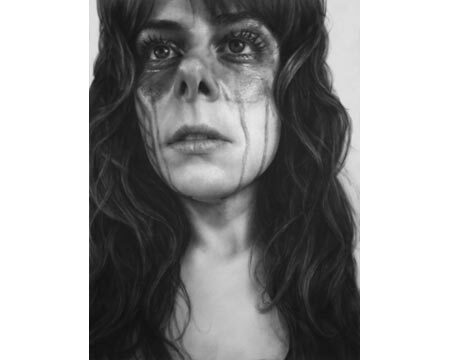 She plays with gender and stereotypes as she expresses different moods and vulnerabilities in each drawing. The drawings themselves are richly textured and confrontational. Included is a short video that documents Cooke's process and further explains her role as a performer. This is a rare talent who, at a young age, has already developed a sophisticated body of work.